Me & Mumford Take on Maine – Writer. Editor. Storyteller. My best-friend moved to Maine at the beginning of the summer. She lives, with her husband and son, just outside of Portland. Her best description of it sounded something like this: “I don’t know why you don’t live here… Everyone has a dog and is outside all the time.” So when I got an email from the Mumford & Sons website a few months back announcing the Gentlemen of the Road Tour — and I saw that one of the stopovers was in Portland — I immediately emailed Allison and told her I would be buying tickets and that I hoped she could go with me. Jump to this weekend, I headed up to Maine to visit with my friend — who I hadn’t seen since May — check out a city I’d never been to, and see one of my favorite bands (which I’ve been trying to see for years). As it turned out, the venue for the Portland Stopover turned out to be unbelievably awesome. 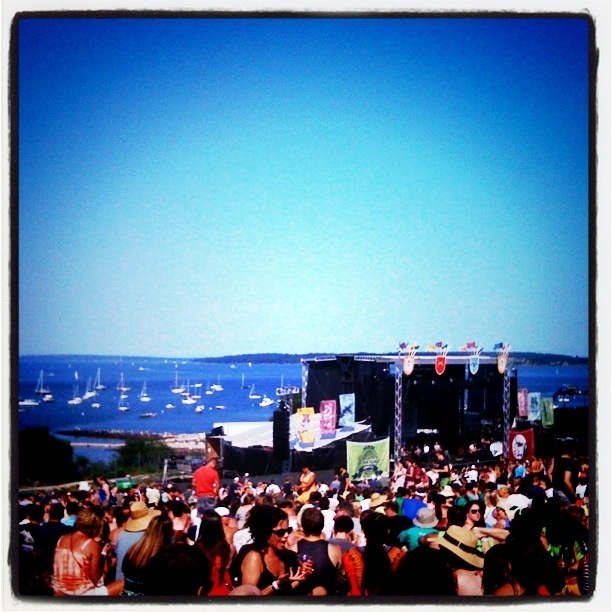 The concert was on Portland’s Eastern Promenade, which rolls gently down to the water. So the backdrop behind the stage was of beautiful water, boats, and islands. They were truly great people and if they’re out there I hope they know it… and that I’ll be searching for someone to do something nice for over the next few weeks. For now, the best I can do is a share video. The encore ended with a big group sing-a-long of The Band’s “The Weight.” Not only do I happen to love that song but I’ve been on a The Band kick because of this video of Glen Hansard and Lisa Hannigan singing “The Night They Drove Old Dixie Down.” It was the best concert I’ve been to in a while, and not just because of the music, but because it’s a cool city, filled with cool people.